Sen. Bernie Sanders (I–Vt.) today introduced a bill that would greatly expand the estate tax, allowing the federal government to take up to 77 percent of a billionaire’s net worth after they die. 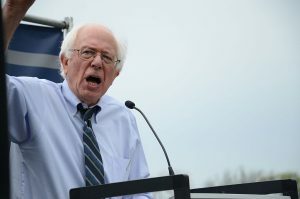 Sanders’ plan would represent a significant overhaul of the way the government determines how much of a person’s estate to take before the remainder can be transferred to surviving parties. Under the Tax Cuts and Jobs Act, signed into law by President Donald Trump in late 2017, the estate tax applies to those passing down more than $11.2 million, according to Tax Policy Center. The estate tax rate for all sums above that amount is a flat 40 percent. 75% why not 100% tax on the Wealthy Bernie you MORON…. This way the wealthy can’t build any factories, create any jobs, they can’t buy anything, & they can move their wealth to a different Country. Go tell that to Soros, Buffet, Koch Bros. Another utopia clownazz.. I see more Flakes got out of the Cereal Box. Talk about stealing from the public. Does this include him in the tax? He is trying to pretend Alexandra idea was his? He wants to fund the illegals so tax the rich that make jobs? I am asking this ARE YOU BETTER OFF UNDER PRESIDENT TRUMP OR WHEN OBAMA WAS IN OFFICE? This reminds me of a time the Reagan taxed unemployment ins.. Prior to that it was tax free. I got 258.00 a month and had to put away 70.00 for taxes. And aoc came from little preto rico in nyc.. MADE her living in/on a bar..
Why is it all Liberals seem to think they have the knowledge to tell every one else how to live their lives? And why is it that those same Liberals cant earn a living in an honest profession the only thing they seem to be good at is living off the labor of others!